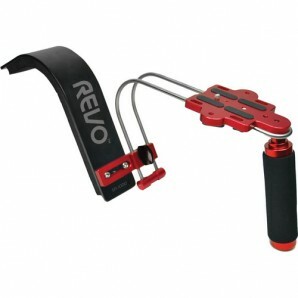 The Revo SR-1000 Shoulder Support Rig is designed for a run-and-gun style of video shooting and enables smoother camera movements than are otherwise possible with a handheld set-up. Weighing just 2.25 lbs, the SR-1000's lightweight, ergonomic design helps to reduce fatigue for prolonged use. The rig supports a max capacity of up to 5.5 lbs, which is suitable for a DSLR or small to mid-sized camcorders. The shoulder support pad is reversible for a right-handed or left-handed configuration, and the assembled rig is forward, backward and height adjustable. The foam padded handle can also be detached for use as a stand-alone support for lightweight cameras. 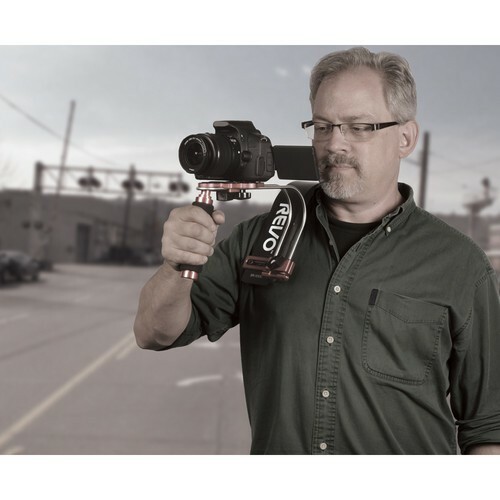 The SR-1000 is an essential tool for adding a professional level of polish to video projects, especially when using a camera with ergonomics better suited to still photography. Stabalizes shot and lets you walk around all day without wearing out your arms! Was hesitant to order because the two wire "rails" look thin in the pictures but I've found the rig to be very sturdy. Great fit for me but my 6'2'' brother finds the support a bit short. Great product, will recommend to my friends.